Australian ski areas appear to be having the snowiest winter, at present, of the four major southern hemisphere ski nations (Argentina, Australia, Chile and New Zealand). The latest accumulations today has seen most of the country's half-dozen leading areas reporting 25-35cm of fresh snow. Bases have been building to 142cm (Mt Hotham - pictured) with most of the others reporting 130cm+ bases – good depths for Australia. The heavy snow today is part of an ongoing snowfall in the country with some resorts already reporting 50cm totals in the past few days, others likely to reach similar totals by tomorrow with more heavy snow forecast. Although a few ski areas in Argentina and New Zealand are posting deeper bases than the Aussie areas, their stats are largely based on snowfall in June at the start of the season with few large falls reported in the past month. 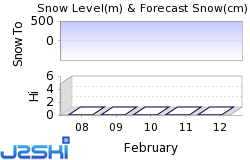 Most ski areas in the southern hemisphere are currently posting bases of less than 1.2 metres however. Where is there snow in Australia?